Will it be considered cheating if I include several different types? 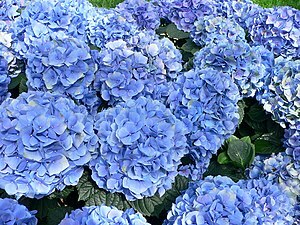 The classic Mopheads, (blue or pink, depending upon your soil) Bigleaf Hydrangea (hydrangea macrophylla) are stunning in the late June and July garden. A hedge of them is lovely, where they can get morning sun but some shade in the afternoon and they’re great at the back of a perennial border, if you have the depth. There are dwarf varieties available, for those with small gardens. They combine well with roses, which, if allowed to drape over them, can create beautiful color combinations. Ditto for clematis. The large-flowering white snowballs are Hydrangea ‘Annabelle’ (now also available in pink…yes ‘Blushing Annabelle is on the wish list) are magnificent plants and can give even a two year old garden a quality of maturity. They can take quite a bit of shade. The oakleaf hydrangeas have airy white pannicles that light up a shady spot. Their foliage turns a rich mahogany red in the fall, adding interesting color to the shrub border. Once again, there are several varieties, early flowering, late flowering, pink flowers, white flowers, golden leafed, dark-leafed. 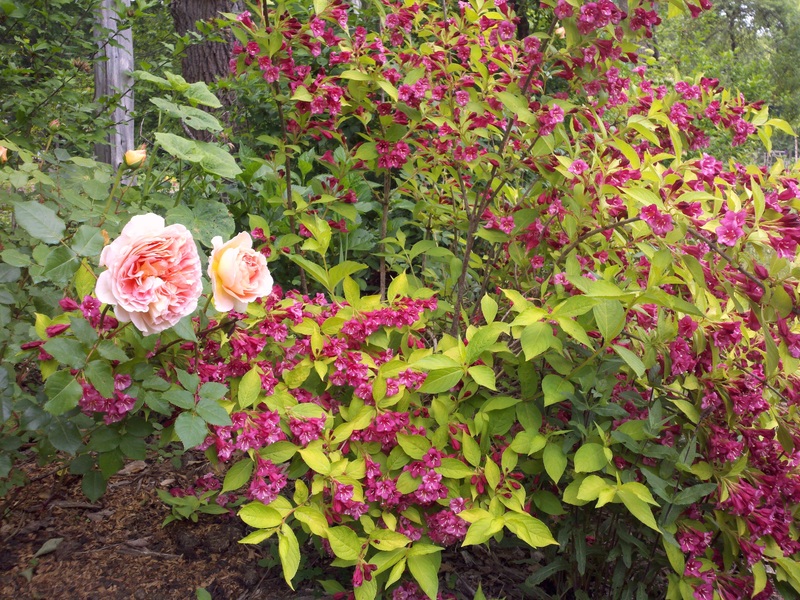 Golden-leafed weigela provides a luminous, impressionistic quality to a shrub border. Commonly known as Mock-Orange, this shrub is lovely when flowering, yes, but, more importantly, it’s is all about fragrance. You can smell its sweet perfume from 30′ away and that alone is reason enough to plant it in a sunny spot somewhere near a patio or where you like to spend time in your garden. There are several cultivars available, some with single blooms, others, double. I like Minnesota Snowflake, a clear, pure white, double blossomed version. 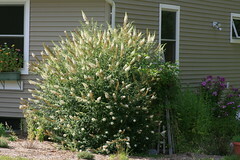 It doesn’t have much going for it, other than good clean dark foliage and disease and pest resistance, when its not flowering, so plant other small shrubs or perennials at its feet to provide floral and/or foliage interest throughout the growing season. for floral arrangements, Fragrant ones, to boot!